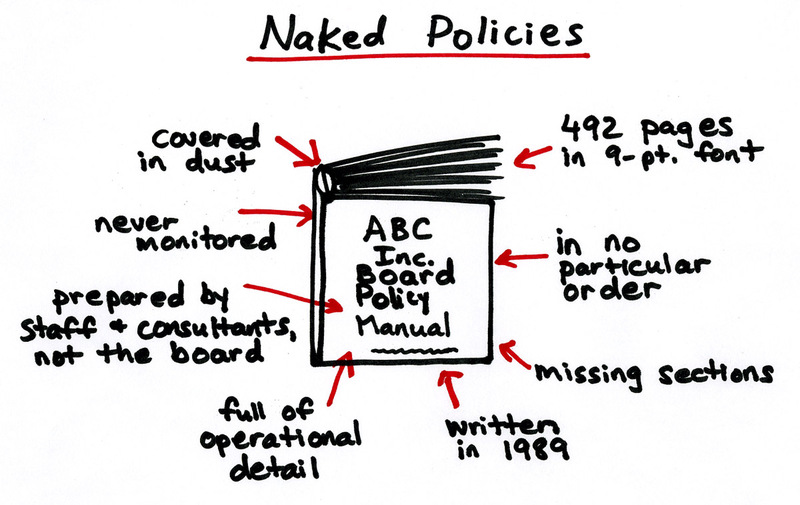 “Policy” is not the sexiest word in the English language, but most people grudgingly agree that boards should have at least some policies written down for legal reasons, if nothing else. However, boards that simply have a few policies on the books miss out on the benefits of using a logical framework of principles like Policy Governance. For example, let’s take an organization that has created a Conflict of Interest policy, a Harassment policy, a Procurement policy, and that also has a strategic plan outlining vision, mission, values and objectives. While having some direction and policy seems better than having none at all, an organization like this is missing the opportunity and benefits of having a clear, simple system inside which everyone knows what is expected in every situation. Policy Governance, which is comprised of ten principles, provides boards and organizations with this tremendous advantage. Rather than establishing policies on a few scattered subjects, boards using Policy Governance principles have a complete set of policies that express the board’s values underlying every decision made within the company or organization, at least on some level. This comprehensive set of policies ensures that everyone can operate using the same playbook that guides decisions and behavior, even when entirely unforeseen events occur, as they do. But being comprehensive is not enough; indeed, many well-intentioned boards make too much policy. For it to be useful, the board’s policy manual must also be concise; that is, it must say all that it needs to say, and no more. Policy Governance principles pay very high dividends here, because they enable policy manuals to be meaningful and practical in everyday organizational life. Having policies is one thing; following them is another. 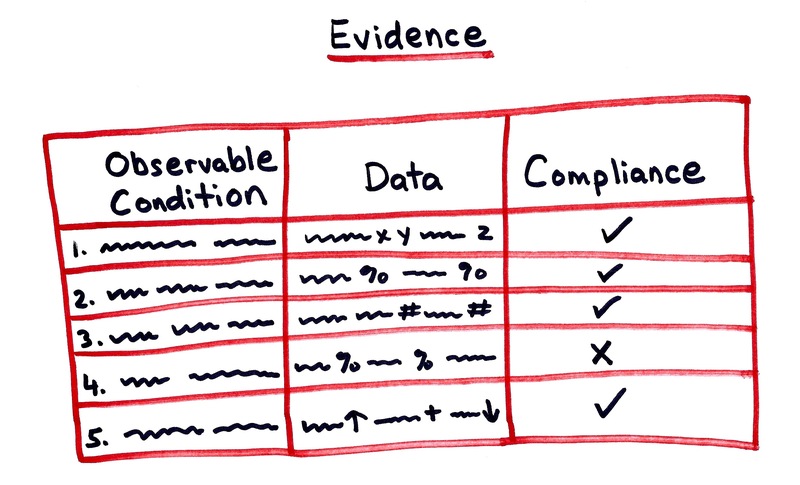 What good is a policy manual if it cannot practically be understood, followed, and monitored? One Policy Governance principle that enables boards to develop concise policy manuals is the Policy Sizes principle, which states, in part: “The board decides its policies in each category first at the broadest, most inclusive level. 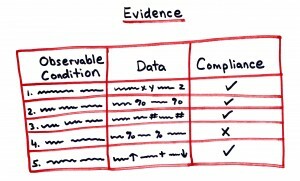 It further defines each policy in descending levels of detail until reaching the level of detail at which it is willing to accept any reasonable interpretation by the applicable delegatee of its words thus far.” (See: Policy Governance Source Document, International Policy Governance® Association). 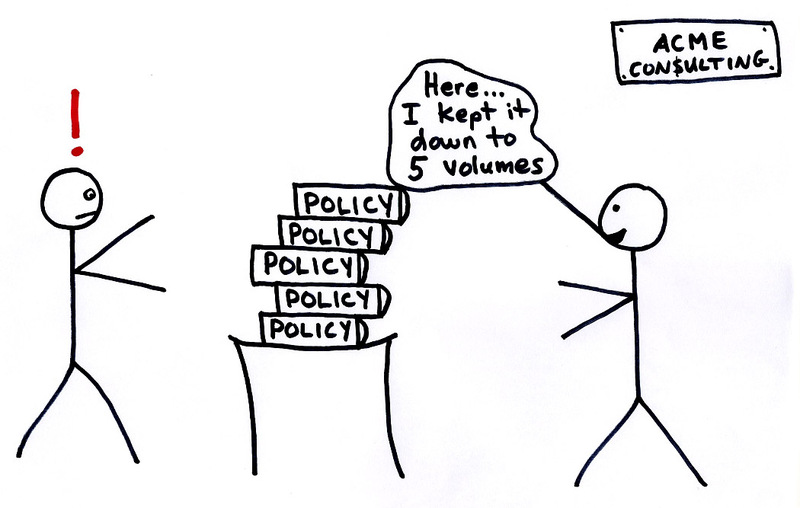 When policies are written in order from broad to specific, a great deal of unnecessary verbiage can be excluded. Another Policy Governance principle that enables brevity is the Any Reasonable Interpretation principle, which allows boards to stop writing policy at the point at which they feel comfortable with “any reasonable interpretation” of the policy. This principle helps boards and CEOs to save a great deal of time that other boards spend delving into operational detail, do-it-this-way vs. do-it-that way conversations, micro-management, misunderstandings, outright conflict, or worse. If your board has or needs policies and wants the benefits of using Policy Governance principles, set up a brief free consultation with us or check out the links below for more information. 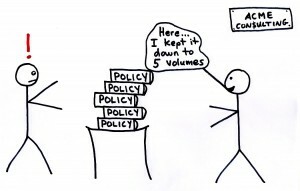 One of the many benefits of adopting Policy Governance® (otherwise known as “the Carver model”) is the fact that more is published about both Policy Governance theory and practice than about any other approach to board governance. Thanks to the work of Dr. John Carver, Miriam Carver, Caroline Oliver, and many other writers, a wide variety of Policy Governance publications are available. This extensive body of knowledge means that any board of directors can study Policy Governance on its own, and use resources such as Reinventing Your Board, The Board Member’s Playbook, and Getting Started With Policy Governance, to create a board policy manual and to implement the system. Brown Dog Consulting’s YouTube channel also offers tips and advice, plus the Board Leadership publication features many in-depth articles on multiple specific topics. That said, when a board starts to explore the adoption of Policy Governance, it should consider these three advantages to using the services of a trained, skilled and experienced Policy Governance consultant. An Independent/Outside Perspective: Boards, CEOs and staff members can benefit from the services of a consultant who is not attached to any particular set of interests inside the organization. A qualified Policy Governance consultant does not “side” with the board or with the CEO or staff, but rather uses his/her guidance and coaching skills to show what the principles of Policy Governance are, and to have clients see the extent to which they are using these principles for the benefit of the organization’s moral/legal owners. Fun, Engaging Learning Process: It’s not clear how this rumor got started, but some say that “governance” is considered to be a “dry topic.” All the more reason, then, to find a Policy Governance consultant who knows how to bring life, stories, and humor to this topic, and who can design workshops and learning experiences that all workshop participants will value and remember. Speed and Efficiency: A qualified and experienced Policy Governance consultant is also able to help boards of directors, CEOs, staff and key stakeholders to grasp the principles quickly, to troubleshoot challenges as soon as they arise, and to help clients customize their use of this system to fit their own values, style, and culture. Experienced Policy Governance consultants have worked with many different types of boards, organizations, and people, and — when combined with strong facilitation skills — are well-equipped to inspire clients to attain the benefits of Policy Governance as quickly as possible. 3. Group facilitation and/or adult education skills. 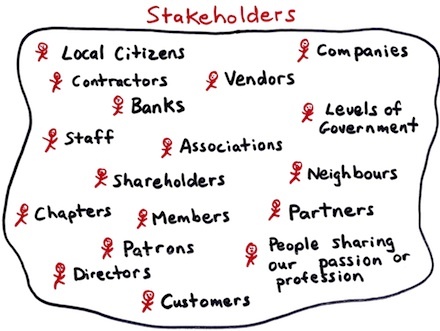 What is at the heart of Policy Governance®? Policy Governance is a set of ten principles that enables boards to lead organizations accountably and effectively on behalf of a moral or legal ownership. These principles help boards to organize and to clarify all expectations of the CEO1, board committees, and board members, and to make sure that these expectations are being met. How do Policy Governance boards minimize risk? Boards state in policy what staff actions, decisions or organizational circumstances would not be acceptable, even if they were effective in achieving the Ends. 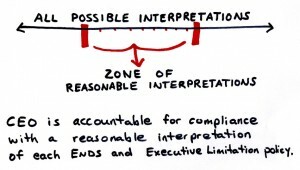 These ‘Executive Limitations’ policies typically put off limits operational means that are illegal, imprudent, or unethical. The board then regularly monitors compliance with these (and all other) policies. The board’s intent in creating Executive Limitations is to minimize risk to the organization on behalf of owners; not to tell the CEO how to do his/her job. The concept is like building a corral inside which the CEO operates freely — as long as he/she complies with any reasonable interpretation of the Executive Limitations policies. How do boards make sure that their policies are being followed? Creating policies is only a start. To be accountable to owners, boards must monitor compliance with their policies. 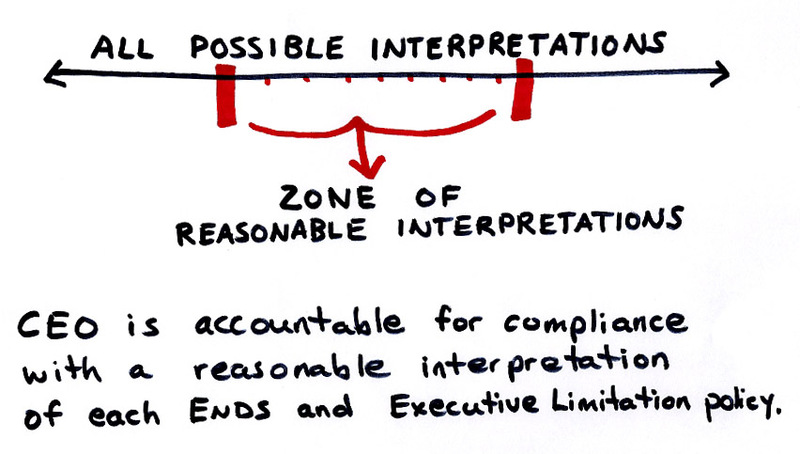 When monitoring the CEO’s compliance with Ends and Executive Limitations policies, the board as a whole will determine if (1) the CEO’s interpretation of board policy is reasonable, and (2) if evidence supports compliance with that interpretation. This process involves setting up a monitoring schedule that identifies the frequency and method by which each policy will be monitored and the submission of reports as scheduled. What happens when the CEO doesn’t follow the policies? Compliance issues will normally be identified through this monitoring process. When a CEO reports non-compliance, he/she should indicate a timeline when he/she will be able to show compliance with the policy. If the board determines that a CEO’s interpretation is not reasonable and/or the evidence does not support compliance with the interpretation, it might also stipulate a timeline for a revised report, increase the monitoring frequency of that policy, change the monitoring method for that policy, change or delete the policy itself, choose to do nothing, issue a warning, take disciplinary action, or fire the CEO. See also: Carver Governance Design’s Monitoring FAQ. What about judging plans made by the CEO? All criteria for judging the CEO’s performance are stated by the board in its Ends and Executive Limitations policies. Monitoring compliance with these policies is how the board learns how well the organization – and therefore the CEO – is performing. While a CEO might wish to share additional information (e.g., plans) with the board or ask one or more board members for advice or ideas, these communications would be considered separate from the monitoring process in place. See also: Suffering Board Approval Syndrome? Our board members want to help the CEO/staff. Can they? The CEO is free to invite board members (or owners or anyone) to help him/her to achieve the Ends (and comply with Executive Limitations) as volunteer staff support at any time. When board members volunteer, however, they must take off their “board member hats” and understand that, when acting as volunteer staff, they are now accountable to the CEO. Board and staff members should also bear in mind that board authority is group authority and no individual board member has any individual authority unless that authority has been specifically delegated to that board member by the board as a whole. Can boards come up with any policies they like? Yes – as long as the policies are written in a way that is consistent with Policy Governance principles and they reflect the board’s wise and informed consideration of the owners’ values. In the ongoing policy creation and amendment process, therefore, it is critical to understand what Policy Governance principles are, and how they work in practice. The board must also regularly link with the ownership to discern their values and have good information about the industry, sector or relevant field of endeavor. Wouldn’t it be easier if we were a “working” board? If a board chooses to operate as a “working” or operational board, it must still ensure that its core governance responsibilities are being fulfilled. As such, a board could use Policy Governance principles to govern the organization, and then — mindful that its members will be wearing multiple “hats” — conduct meetings as a management/operational body as well. The greatest challenge in using Policy Governance is that it represents change from doing things they way they were always done before. 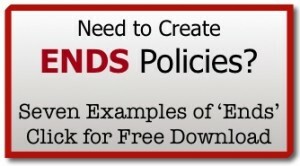 To enjoy the benefits of using Policy Governance, e.g., having maximum owner-accountability and creative freedom for staff, it is important to invest the time needed to ensure that all board members and management understand what is (and is not) consistent with Policy Governance principles. This investment pays for itself many times over when common areas of organizational dysfunction disappear, and instead, owners are satisfied with the results being achieved, board members and the CEO are clear about their responsibilities, and staff are motivated and productive. 1 For simplicity, the term CEO is used here to refer to the lead of operations, whether that person’s official title is CEO, Executive Director, General Manager, or other. Is your board fighting a losing game? Just as Lucy and Ethel struggle to keep up with wrapping the chocolates in this classic I Love Lucy scene, boards of directors can also find themselves fighting a losing game when operational activities, plans, budgets and decisions come at them faster than can be properly handled. A board will never be able to keep up if it continues following and reacting to staff initiatives rather than leading and directing the organization or company. How many of these symptoms of reacting vs. leading does your board experience now? Does your board meeting agenda look like this? The board meeting agenda is primarily or completely created by staff. The board meeting agenda includes many ideas, decisions or plans requiring board approval. Board meeting time is spent discussing operational tactics, events, minutiae. An Executive Committee makes many decisions on behalf of the whole board between board meetings. Board members feel they are “rubber-stamping” staff decisions and/or are unsure of the value they add. 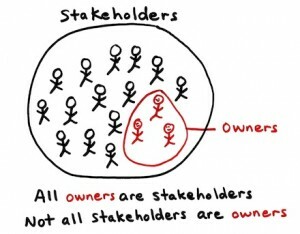 Lack of time/energy spent on designing the future and ensuring that real owner-accountability is taking place. Rest assured, there is a way for boards to truly lead organizations ethically and accountably, while maximizing freedom for the CEO and staff to achieve results. 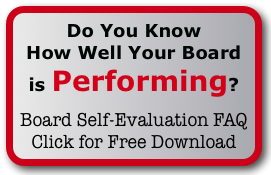 To stimulate new conversations around your board table about accountability, delegation, and governance, download the free board discussion tool below, or schedule a free consultation for more information on how to boost board and organizational effectiveness. See also: Suffering Board Approval Syndrome? and Got the Boardroom Blues? Do your board members only think they know what their board policy manual says? Whether your board of directors is using the Policy Governance® system or not, there is no point in having any board policies if nobody knows or understands them, if they are not used, and/or if there is no regular way of checking to see if the policies are being followed. But knowing, understanding, and being accountable is difficult if board policies are lengthy, complicated, disorganized, incomplete, out-of-date or irrelevant. reflect input from owners and key stakeholders, as well as board members’ values. To learn more on how to create a practical, time-saving, and meaningful board policy manual, click here to schedule a free consultation. There, I said it, and I am not apologizing, either. Wow, my eyes don’t glaze over. Instead, my heart skips a beat! What is up with that? Why do I burn the supper while furiously following #corpgov tweets? Why would I spend lazy Sunday mornings obsessing about splitting the chairman/CEO roles? Why does governance haiku float through my mind while I’m walking the dog? My rationale for being passionate about board governance is threefold. Bad Board Meetings, Be Gone! 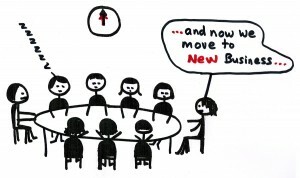 First, I hate bad board meetings, and everything that entails: people talking in circles, covering ground that has been covered before, long discussions with no apparent relevance, people not paying attention, pointless arguments about details, boring presentations, wasted time, and did I mention people talking in circles? If you’ve ever experienced the boardroom blues, I feel your pain. So I am thrilled when I witness a great board meeting, where the agenda is logical, the conversations are rich, the decisions are meaningful, and the participants are focused, happy, and engaged. Love it! Second, the world needs to allow people to have more creative freedom in their endeavors. Don’t you love being able to figure things out on your own, and having the ability to innovate, to invent solutions, to try new ideas, to be spontaneous, to get things done quickly and to have fun in your work? I’m all for following rules, but to me that means the fewer and clearer rules there are, the better. Don’t make me fill out a stack of forms or read three-inch policy binders. Let me brainstorm, create, design and invent, and I’ll be uber-happy always. This love of freedom means I can’t say enough about a governance system like Policy Governance that liberates both board and CEO to fulfill their respective roles. When the roles and rules are clear, everyone can create, achieve, and work with a real sense of joy. Board members and CEO alike know what they are responsible or accountable for achieving and understand the broader values that direct everything the organization does. Then, when the work is done, everyone can honestly feel pride in what they’ve accomplished. Third, I simply (and humbly) want to help make the world a better place. Humans are social animals and while there is no shortage of outstanding individual achievements to marvel at, people, in my view, are at their greatest when they work well together in groups. All the best teams in the world use systems, and so if we can just match the good people who serve on boards of directors with an effective governance system, so much more progress becomes possible. That’s my story and I’m sticking to it. What mark do you want to make in the world? 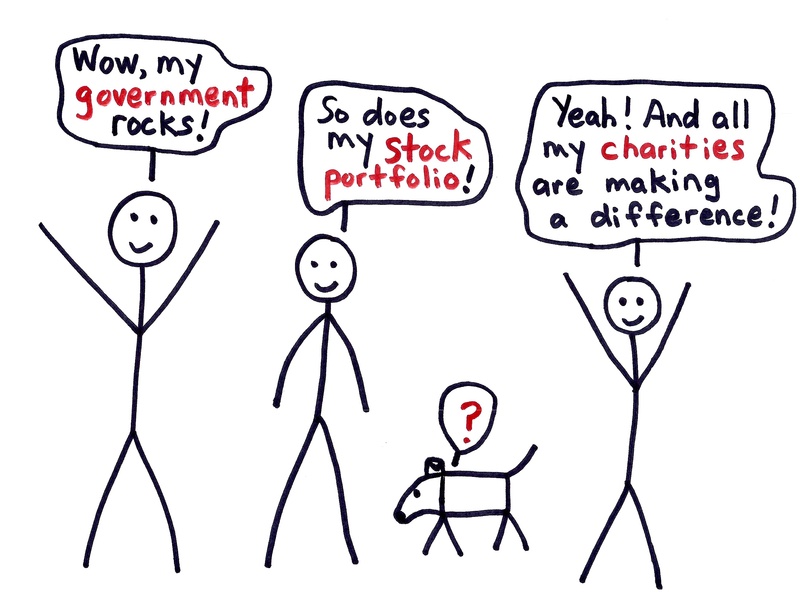 And do you love governance — well, good governance — too? Please share with us your story. 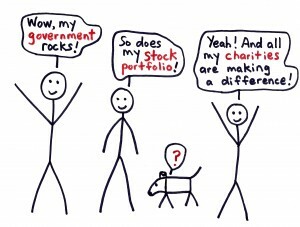 See also: Is Your Board of Directors Ready to Explore Policy Governance? Yes, we know you were elected or appointed to the board of directors because of your expertise, your skills, your background, your hard work, your personality, and/or your commitment to the company or organization. Or maybe you stepped up when nobody else volunteered. Regardless of how you became a board member, we know you are a smart, well-intentioned person with valuable experience. The trouble is, when it comes to being a board member, it’s not about you. And this is the paradox of board leadership: while you might earn a seat on a board of directors or council thanks to your abilities, knowledge, and/or popularity, truly serving well as a board member means leaving your ego far, far behind. There are two main reasons for “checking your ego at the door.” First, board authority is group authority. 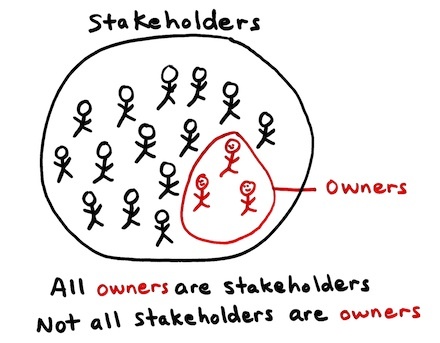 A fact of life that every board member must understand — if not embrace — is that board authority is used as a group, and no individual board member has any individual authority unless that authority has been given to him/her by the group as a whole (see Policy Governance’s Board Holism principle). Second, the function of a board member is not to serve any personal interest, but rather the interests of the moral or legal owners, whoever those people might be (see Policy Governance’s Ownership principle). Unless the board members are the same people as the owners, there is always another group of people to whom a board is ultimately accountable, and therefore those people must always be firmly in board members’ minds. 1. Am I deciding or behaving in this manner for the good of the board as a whole? 2. Am I deciding or behaving in this manner for the good of the legal/moral ownership? Are your board members behaving from the “me” or from the “we”? To start key conversations about accountability at your next board meeting, use the free board discussion tool below. 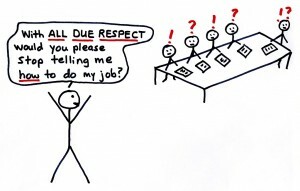 To paraphrase W. Edwards Deming, how many of you have deadwood on your board? Did you appoint or elect them that way, or did you kill them? Given the critical role that boards of directors play, it’s unfortunate to see so many boards struggling with “deadwood.” Then again, losing good people to boredom or indifference becomes somewhat understandable when we witness what actually happens in board meetings. 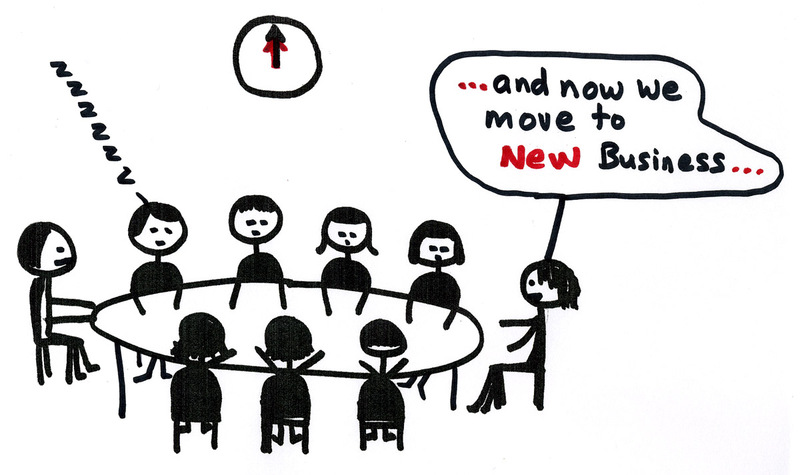 Long, frustrating, unproductive and/or boring meetings – the inspiration behind our video, Got the Boardroom Blues? – have led to the departure of many formerly committed board members. A. 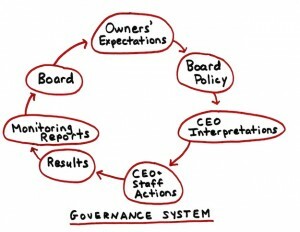 A clear system of governance principles that is understood and applied by board members and staff. B. Good people with varied backgrounds and perspectives who are committed to the purpose of the company or organization. C. A culture of servant-leadership and accountability in which behaviors match shared values. Once boards have these core elements in place, there is always room for improvement when it comes to the effectiveness, efficiency, and – dare we say – fun, of board meetings. While getting the best out of people in a group setting is no easy task, here are ten tips to help make your board meetings more effective and engaging. 10. Invite observers: If key ingredients A, B, and C (above) are in place, inviting observers to attend your board meetings can help to elevate the level of discussion and engagement of board members, in addition to demonstrating transparency. Observers can be staff members, consultants, former or future board members, owners or members of the general public, and can be invited to comment or to provide feedback, depending on the type of board. 9. 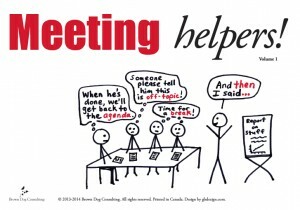 Use Meeting Helpers: This handy set of visual messages helps meeting participants to signal a quick need or question without interrupting the person having the floor, and add an enhanced level of engagement to the meeting. 8. Take Care of Human Needs: Board members are human, too, and so ensuring that the meeting space offers adequate lighting, seating, space and logistics, plus having breaks with drinks, snacks or meals if appropriate, helps to ensure people are focused and productive. 7. Inspire: When people can be so easily drawn into details, ensure that every meeting serves to remind all participants of the big picture – the mission, vision, purpose or Ends of the organization, and the people to whom the board is ultimately accountable. 6. Engage the Senses: The appropriate use of visual materials, color, tactile items, sound and even music can transform a meeting from bland to grand. 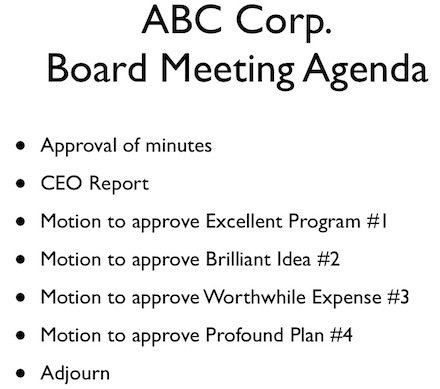 Just be very careful to not subject board members to Death by PowerPoint! 5. Assign Roles: Prior to or at the beginning of each meeting, assign supporting roles to multiple board members. If possible, assign administrative roles like note-taking and timekeeping to a board clerk or staff; other roles for board members include Process Monitor, Facilitator, ‘Devil’s Advocate,’ and the roles identified in Edward de Bono’s Six Thinking Hats. 4. Engage a Facilitator: Professional meeting facilitators are trained to ensure that groups achieve the desired outcomes during the time available (see: What Do Facilitators Do?). If your meetings are not as engaging or productive as they could be, bring in an outside facilitator to design and guide the process for all or part of a board meeting or retreat. 3. Be prepared: A successful board meeting requires that every board member be prepared for discussion. At minimum, the agenda should be circulated and reviewed by all in advance, minutes should be ready for approval, and reports or documents for discussion should be read before the meeting. elements of inspiration, variety or fun. All too often, agendas are quickly assembled lists or are copied from one meeting to the next, almost guaranteeing that the meeting will be no more than literally “going through the motions” and featuring little new information, insights or dialogue. 1. Appoint and Cultivate Effective Leadership: A skilled chairperson or Chief Governance Officer (CGO) plays a key role in ensuring that the board sticks to its processes and values, and that all board members are given the opportunity to perform to the best of their ability. Like the captain of a sports team, he/she should motivate and inspire all board members to fulfill on their commitments for the good of the group and the organization. This role is very demanding, and so do not hesitate to provide board leaders with much-needed insight and training through attendance at events like the International Policy Governance Association’s annual conference. Need help applying some or all of these ideas? 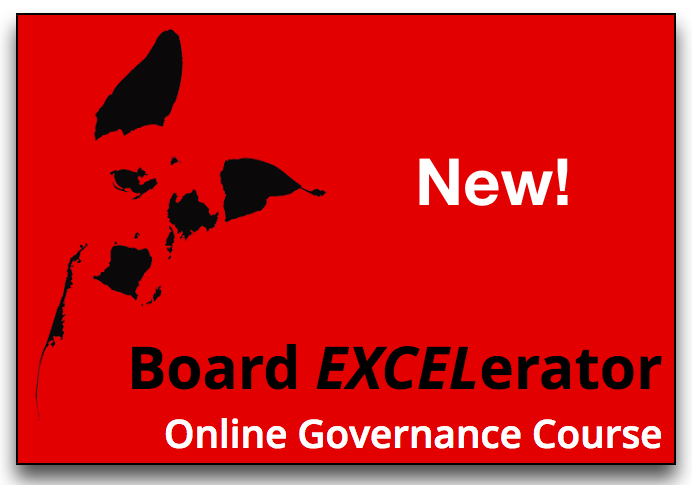 Contact Brown Dog Consulting to get the answers to your questions about board effectiveness. 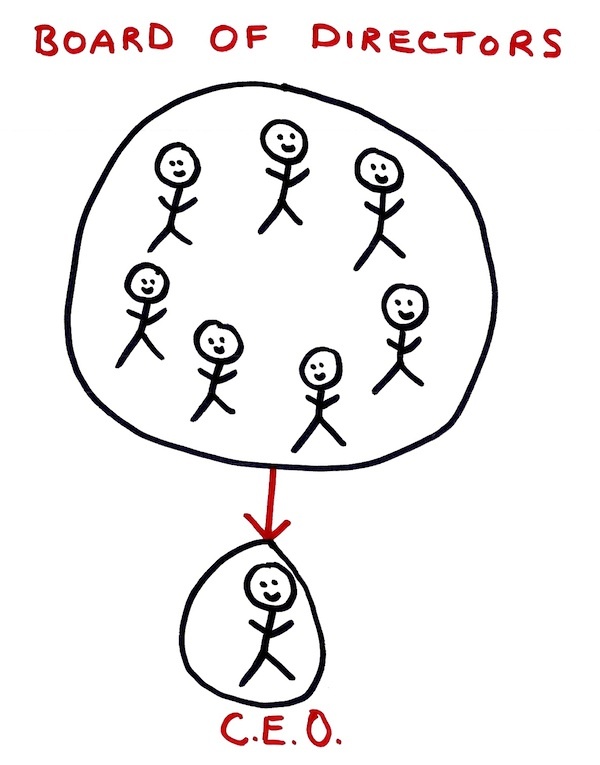 Wondered why smart people frequently get stuck in group dysfunction? Been frustrated by a micromanaging board of directors? Served on a “working” board of directors, where operational and governance roles were combined? Questioned how time was used at a board meeting? Wished that accountability didn’t have to come at the expense of speed, creativity, and results? seem that most directors are intelligent, accomplished and passionate individuals, but yet somehow boards so often experience frustration, confusion, unpleasant politics, apathy, and burn-out? Highlighting the distinctions and connections between governance and management, this workshop illustrates an elegant, principle-based system that benefits board members, senior managers, staff, customers, owners, and other stakeholders. See also: What is Governance? 1. Using a holistic system to govern. 2. Having effective decision-making methods. 3. Being physically and emotionally healthy. 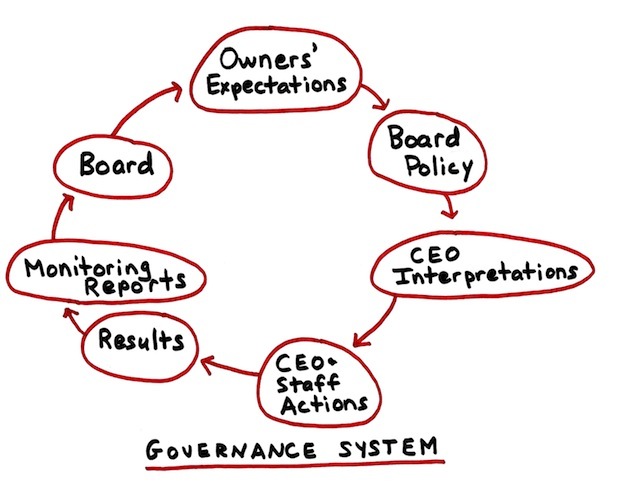 Without a logical governance system, boards and managers can easily lose effectiveness and get off-track. The most common symptoms of board dysfunction include lack of role clarity, duplication of effort, boards approving decisions already made (a.k.a. 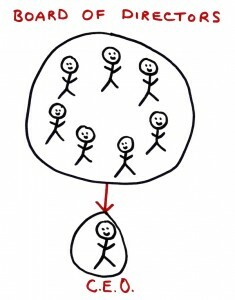 “approval syndrome”), and misalignment between the wishes of owners and the results produced. Once a holistic system like Policy Governance is in place, boards can still struggle with the decision-making process. 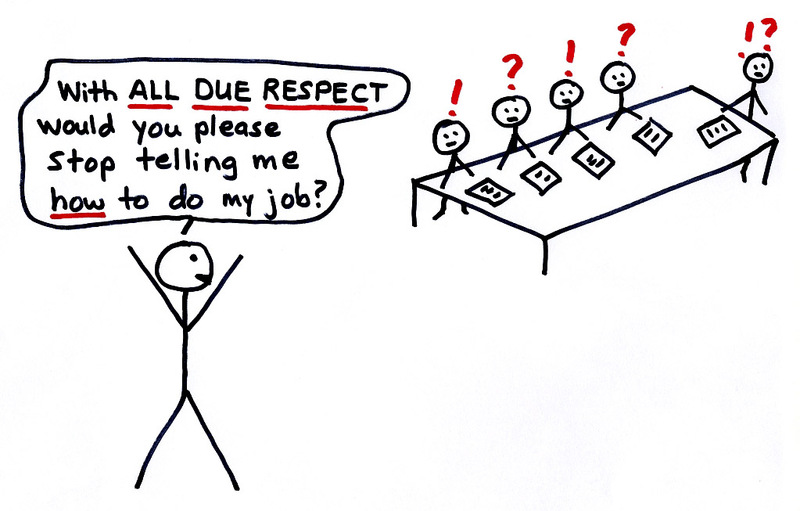 At board meetings, for example, does every board member get a chance to speak on every issue? For how long? How can directors share a wide variety of views, and end up with the best possible decision? Lastly, the physical and emotional health of board members seems like an obvious pre-condition for governance effectiveness, but one that is not often included in “How To Be An Effective Board” lists. The point is simply that governance is not easy, and so like with any other challenge, board members must be up to the task. To think clearly, to make good on commitments, to prepare for and show up for meetings, and to get along with each other means directors must have energy, stamina, and a sense well-being. Feeling good, refreshed and calm enables board members to rise above personal ego for the good of the group. Have you ever seen a board “trying to think but nothing happens”? What was the underlying problem?